Offering you a complete choice of products which include ayurvedic food supplements franchise and nutraceutical products. products are processed in strict compliance with the industry defined rules under the direction of the chemist. Also, we deal with all kind of ayurvedic medicine. There are significant differences between products available in the natural products industry and those available from mass-market retailers such as drugstores, warehouse clubs, and supermarkets. Our products emphasize all natural ingredients and we strive to use organic and NON GMO ingredients wherever possible. Most of our brands are available only through health food stores, who are as dedicated as we are to quality, education, and service. 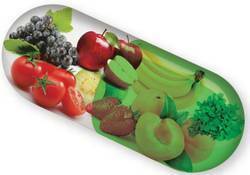 All of Nutraceutical’s products are made from ingredients of the highest quality. We employ quality control standards in all areas of product development – from ensuring identification and authenticity by laboratory analysis to screening for microbes, herbicides, and pesticides to heavy metal testing. We reject herbs and ingredients we suspect or discover are irradiated. Only after our laboratory analysis program confirms that the herbs meet our strict standards do we give the product our approval.